Evoking a Memory | Oke Woodsmith Building Systems Inc. 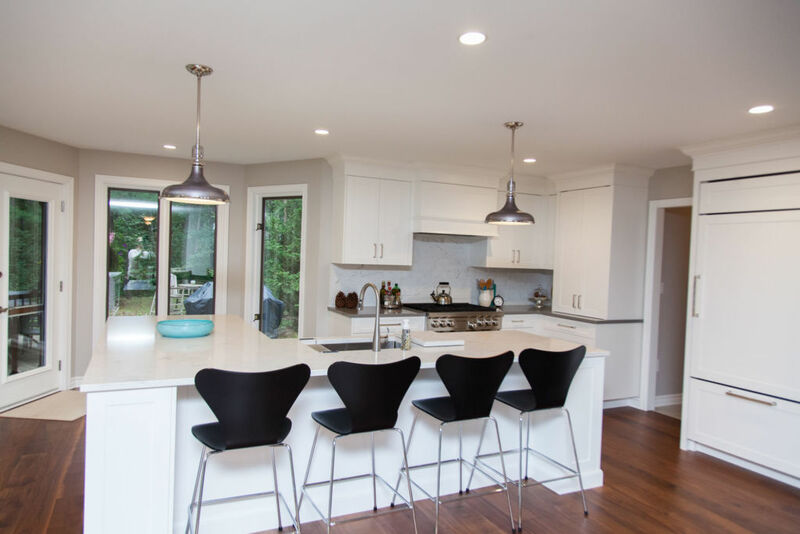 Many major renovations are sparked by a minor repair issue that blossoms into a much larger project. For Duncan and Sue Stauth, the need for a second bathroom inspired a completely new cottage. The four-bedroom, one-bathroom seasonal cottage had been in Sue’s family since her parents purchased it in 1958. The family, from Windsor, spent many summers at the cottage located in Oakwood Park in Grand Bend. “We’d come up after school and not go back till Labour Day, so we spent a lot of time here as a family,” Sue Stauth recalls. The Stauths bought the cottage from Sue’s parents in 1998. After discussing the addition of a second bathroom, they decided to demolish the concrete structure and start over. The couple contracted Oke Woodsmith because of the company’s reputation for constructing high-quality homes. 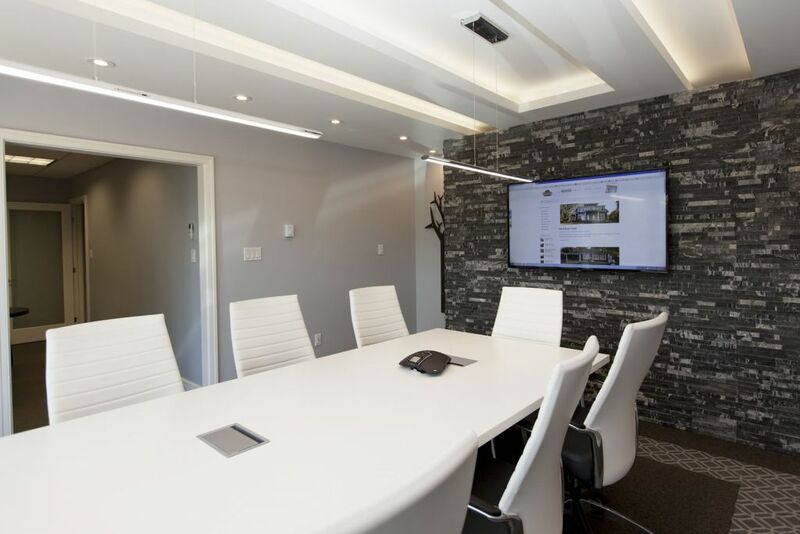 They also liked the fact that the company worked closely with clients to create a home that fit their lifestyle. Oke Woodsmith demolished the cottage in September 2008. The new home, which is constructed of Insulated Concrete Forms for energy efficiency and heated with radiant in-floor heating, was completed a year later. The couple’s fondness for the old cottage led them to incorporate many elements from it into the new home. They decided to retain an old fieldstone wall which made construction of the new home challenging. 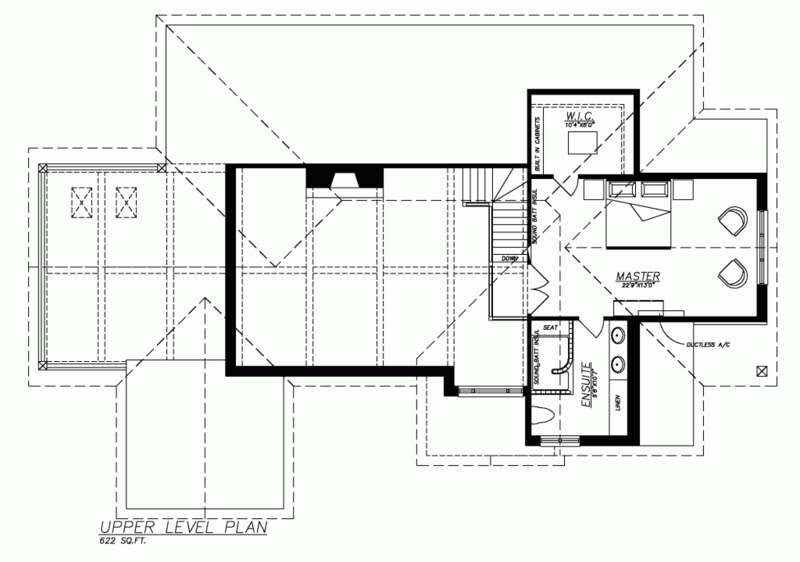 They also wanted to include a loft bedroom and a great room positioned beside the kitchen/dining area. “They worked on the things that were important to us,” Sue says. Duncan and Sue particularly wanted to blend Craftsman elements in the exterior because of the home’s location in a clearing surrounded by oak, pine and blue spruce trees. 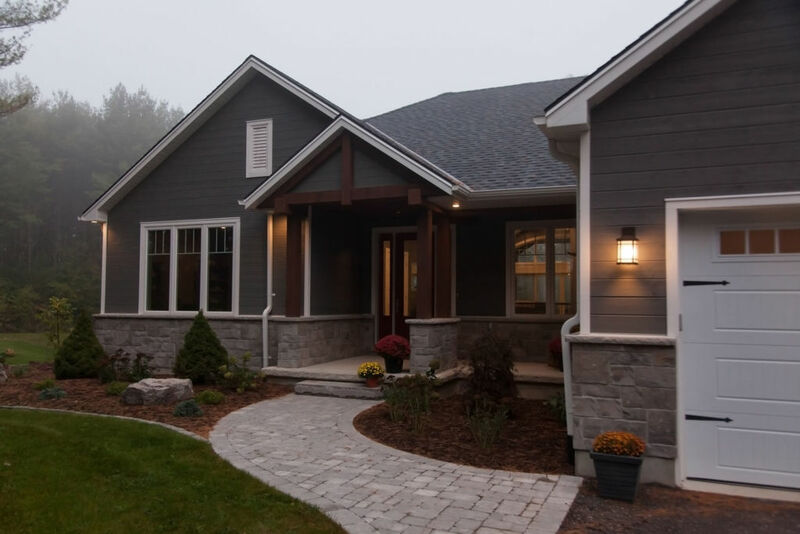 For the front facade, they opted for a combination of Arriscraft stone, James Hardie fiber cement board-and-batten siding and cedar shakes that were hand-dipped in a maintenance-free coating. The use of rustic materials, combined with a timber frame truss that forms an arch above the entry, has resulted in a home that enhances its natural setting. 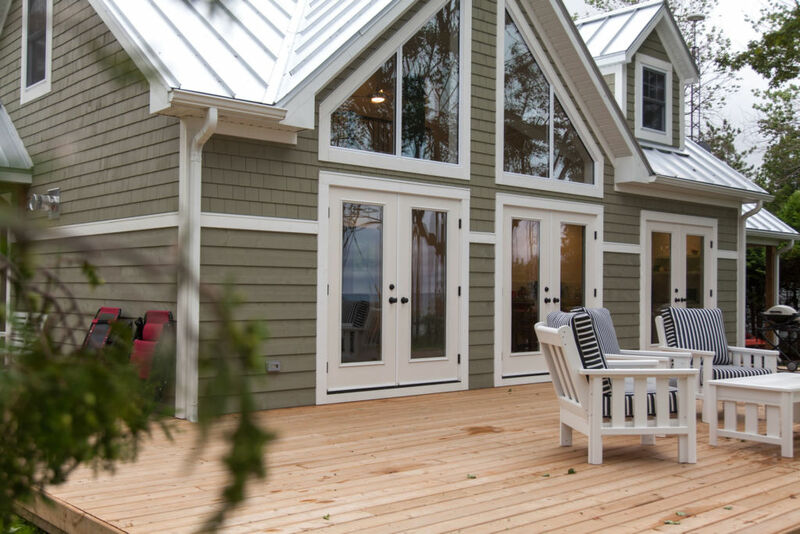 “We wanted the cottage feel, but without a lot of maintenance,” Duncan says. 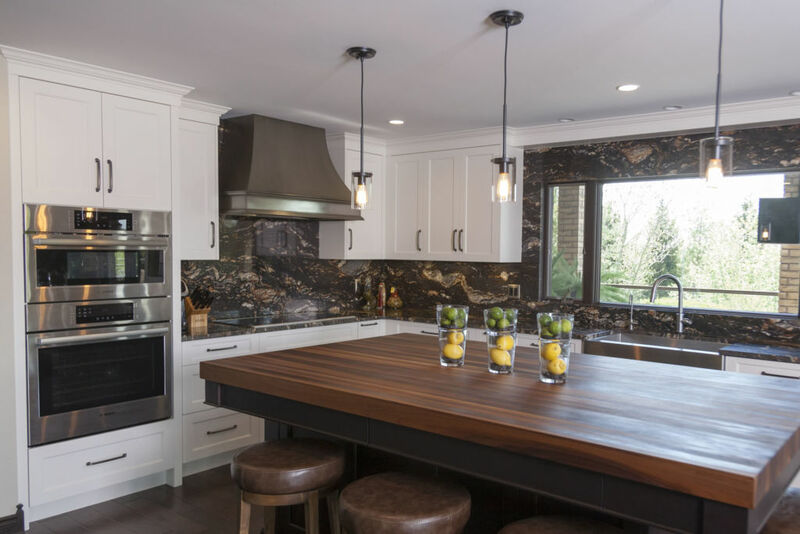 The couple’s desire to incorporate wood, stone and light is evident throughout the 2,800- square-foot home. Beyond the foyer, refined timber frame trusses visually support the soaring two-storey cathedral ceiling in the great room. An angular stone fireplace with a heavy ash mantel forms a focal point for a conversation area created by comfortable leather furnishings. The Stauths tried to retain the original fireplace but, because of the weight of the stone, were forced to compromise. The new fireplace, which closely resembles the original, incorporates three fieldstones and also includes a niche on one side for wood storage. The hearth is made of flagstones that came from the front steps of the original cottage. “We’ve tried to use pieces throughout,” Sue says. 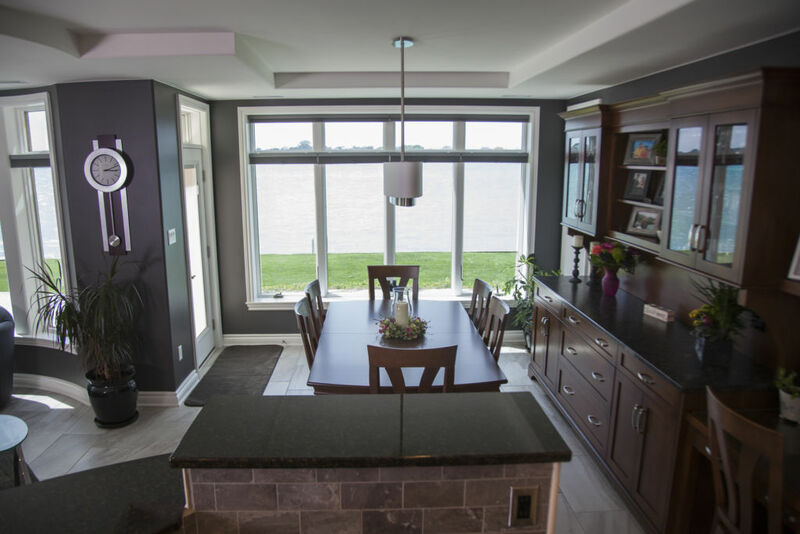 The combination of linear and cambered lines in the great room is particularly evident in a transom window that curves above oversized patio doors. 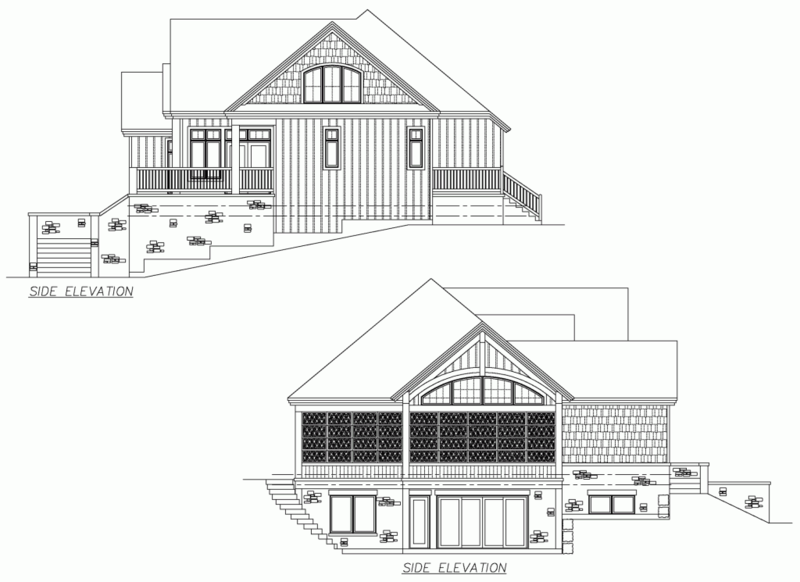 The doors open out to a screened-in porch that features a barrel-vaulted cedar ceiling, walls finished with cedar shingles and a built-in barbecue. The porch was initially designed as a much smaller outdoor living area and was later expanded to its present 18- by 18-foot size. Duncan says he and Sue enjoy splitting their time between the balcony at the front of the home and the porch. “We love being outside,” he notes. A guest bedroom off the great room is balanced by french doors beside it that open out to a balcony with tempered glass railings. The balcony is also accessible from the dining area and kitchen on the opposite side of the foyer. In keeping with the cottage theme, Duncan hoped to incorporate a panelled wall between the kitchen and the great room. Oke Woodsmith improved his idea by using board-and batten panelling to face the wall, as well as an area at the opposite end of the great room above the transom window and the wall along the staircase. Three steps lead from the great room up to the kitchen/dining area, which was elevated to accommodate a lower-level garage. Oke Woodsmith designed an interior barn door to enable the couple and their guests to talk and play cards in the dining area without disturbing others in the great room. Made of heavy ash, the door slides across a 10-foot opening, providing excellent sound separation between the two rooms. “We can have it as one big space and close it off when we want,” Sue says. The Craftsman theme that is so visible throughout the cottage continues in the kitchen. 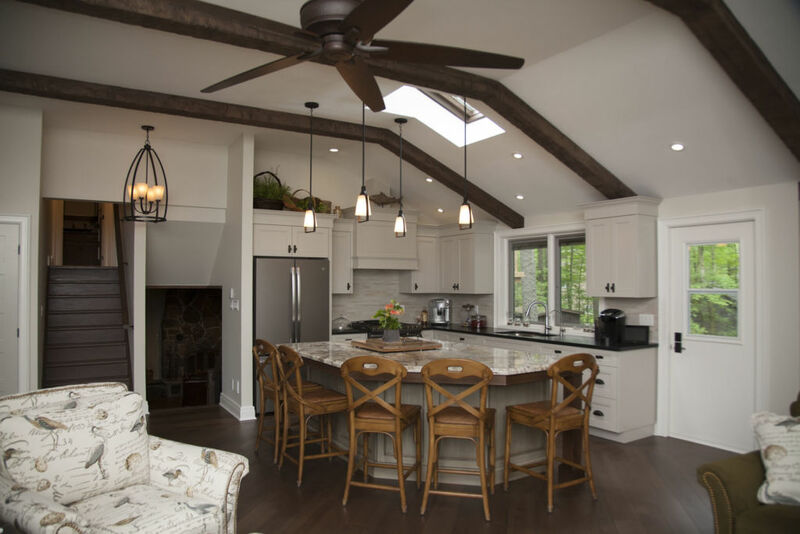 Cherry cabinets in a rustic cottage style form a backdrop to a large centre island with a base of beaded panels and a curved granite counter. A built-in desk separates a walk-in pantry on one side from a laundry room and a two-piece bathroom on the opposite side. In the dining area, a beamed ceiling draws attention to a harvest dining table that was used in the original cottage. 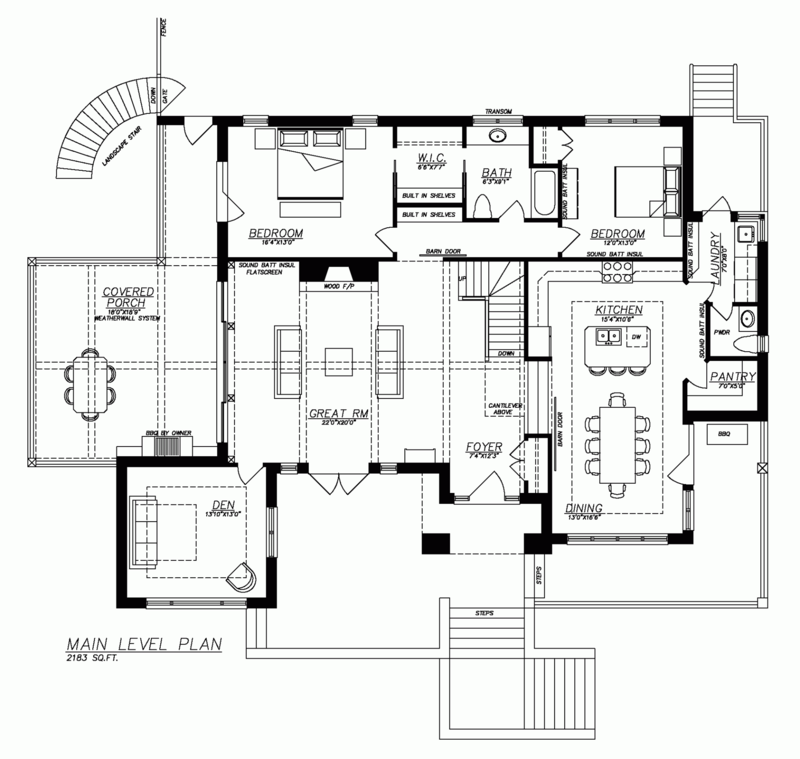 The ceiling treatment was a new addition to the house plans. “That was one of the company’s ideas. You just have to listen to them – they know what they’re doing,” Duncan says. The home makes maximum use of space which is evident in the vestibule off the great room. Lined with built-in cherry cabinetry that accommodates a linen closet and storage for the audio-visual equipment, the vestibule joins an ensuite bathroom with two bedrooms. 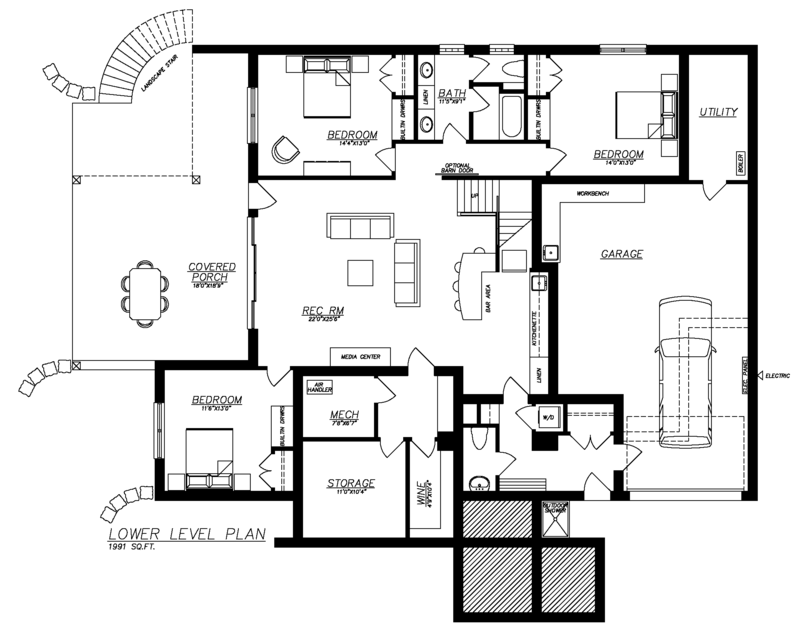 Duncan and Sue plan to use one bedroom, which is connected to the bathroom through a walk-in closet, if they ever develop mobility problems. From the great room, lights illuminate the ash staircase that leads to the second-floor master bedroom retreat. A landing outside the retreat provides Duncan and Sue with a birdseye view of the great room below. 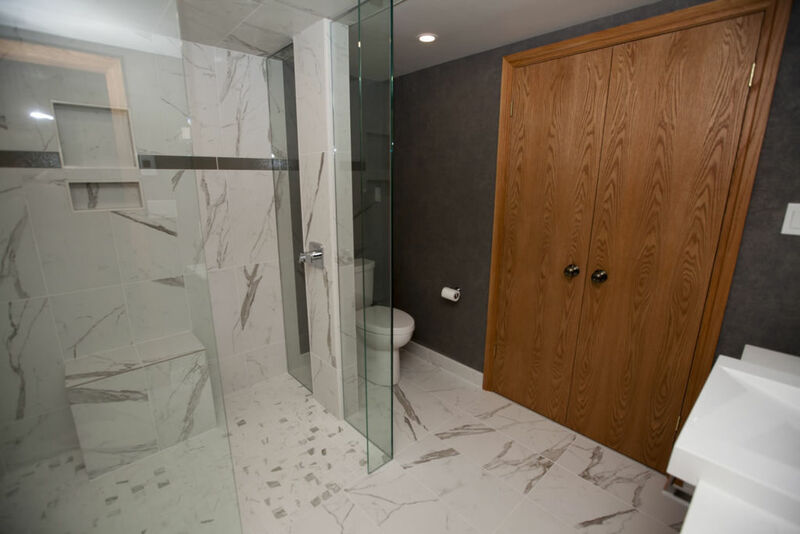 To the right of the bedroom, the ensuite bathroom is fitted with a dark cherry vanity topped with a grey and white marble counter, and two glass block walls that provide privacy for those using the shower. The lower level functions mainly as a guest suite for the couple’s children when they converge on the cottage with their friends during long weekends. An open-concept entertaining room opens out to a covered patio and a fire pit sheltered by a stone retaining wall. 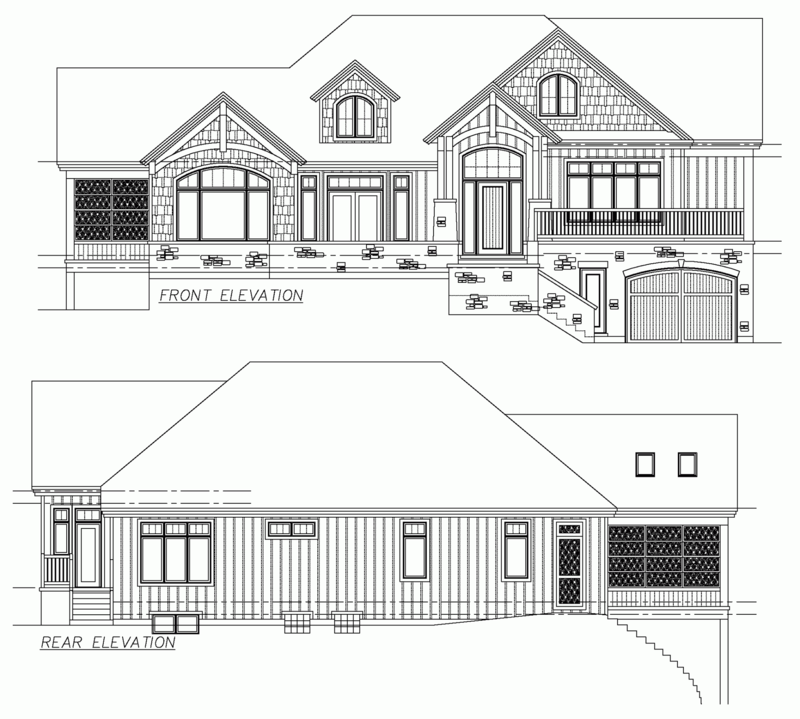 The lower level also includes three bedrooms, 1-1/2 bathrooms, a laundry room and a wine cellar. “There’s lots of room for everybody to find space,” Sue notes. 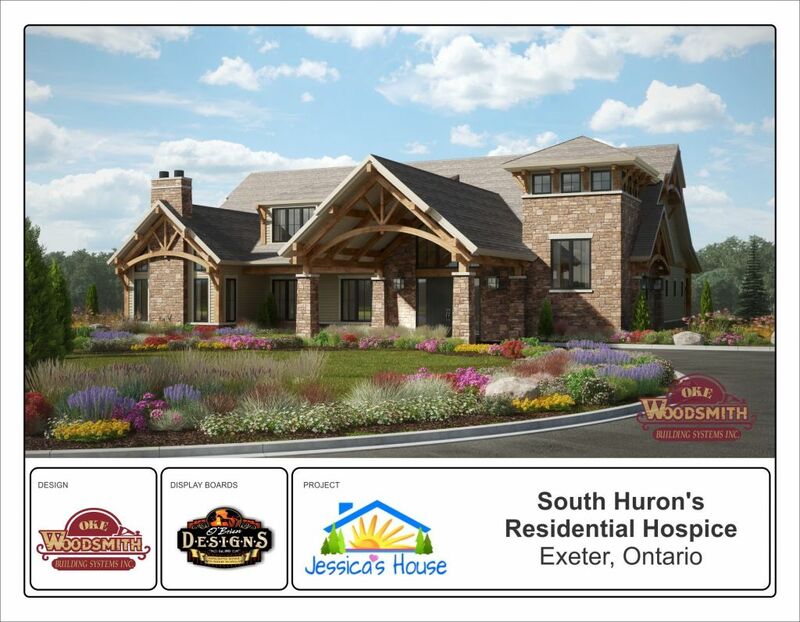 Sue says the home is an ideal vacation home, particularly since it evokes so many memories for her and Duncan. “We both work hard during the week so it’s just nice to come up here. It’s very relaxing for us,” she adds.